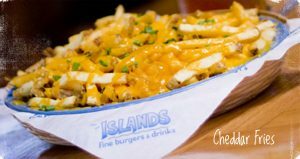 This year, the celebration lands on a Sunday, and while most bars and restaurants limit happy hours to weekdays, Islands Restaurants will have specials all day in the bar area. Repeat: all day happy hour. Specials include $5 mai tais, mojitos, margaritas, sliders and cheddar fries (everything on the menu is under $10), as well as two new cocktails: the Maui Mojito with Don Q coconut rum, Myers Rum, pineapple, lime and mint; and the Blue Hawaiian featuring blue Curacao, rum, piña colada and pineapple. Both were created by Islands employees and will be available for a limited time. And, because National Happy Hour Day lands on a Sunday, football fans can catch all the games with NFL Redzone, Sunday Ticket and plenty of big screen TVs at every location.